A spectacular 4 bedroom contemporary villa combining the best of organic details with an infusion of old Mexico, with breathtaking views of the town and bay. 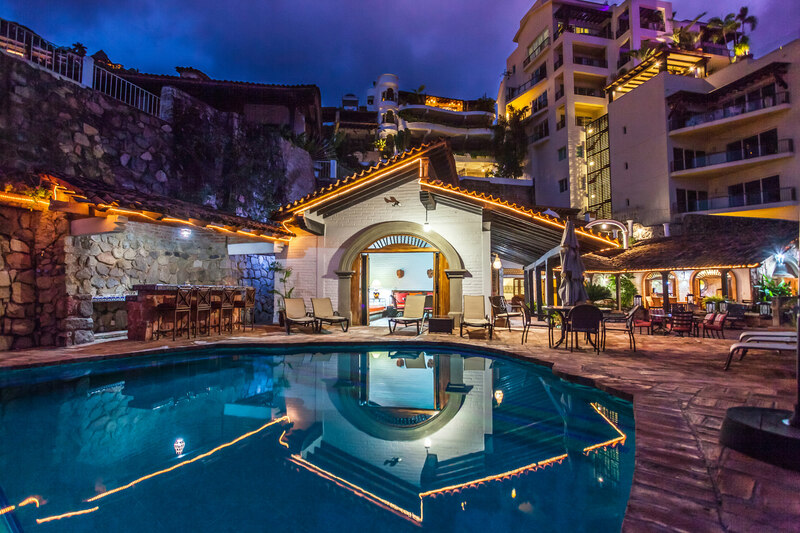 Casa Higuera is located hillside in upper Amapas within walking distance to Puerto Vallarta’s gourmet restaurants, nightlife, shopping and art galleries, as well as the popular Los Muertos Beach. The spacious 7500 sq ft multilevel villa has 4 bedrooms each with private en suite bath, ocean view and terrace, a heated infinity pool and spa tub on the main level, gourmet kitchen and all the luxury details needed for that perfect Mexican escape. Finishing details include beautiful custom hardwoods, natural stone, and hand painted tiles and the lovingly chosen art and antiques. 4 bedrooms w, 4.5 baths, sleeps 8. POLICIES: no children under 14 years, no minors without accompanying adult, Minimum 7 night rental over Christmas & New Years, other times 5 night minimum. Smoking on terraces only.